Despite completing coursework last week, its still a busy week with preparation for the Abertay Digital Graduate Show. Yesterday I picked up my poster from Abertay Copyshop and while my design did print darker than intended (even with a pre-brightening) it still looks pretty good. I did a decent job at mounting it to the foam board (I wouldn’t accept anything other than perfect alignment) which I attached to the wall of my presentation space today. 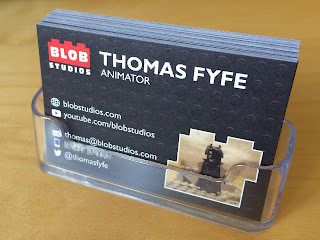 I also received my business cards earlier in the week which I am really happy with. The print quality is very good and the colours are very bold. I’m also happy with the card quality I’ve chosen and the overall design. It might still be a little cluttered on the front with the addition of the pictures of my work but I’m very happy with these. I underestimated how long thumbnails would take to produce but managed to complete them all on time for today’s setup. I opted for putting a short text title on each thumbnail to easily grab the attention of the viewer and so they know exactly what each video is before opening it up. I used the same font as the showcase software with an outline so it is visible. For videos with multiple clips I arranged four images in a grid to show the video is a compilation of work. I also included an overview image because if I included a video first it would autoplay that when selecting “Student Two” so I didn’t want people to get caught off guard, they should be able to start the video in their own time. The deadline for setting up was noon earlier today which I met with ease. I encountered no problems with using the interface software although setup wasn’t entirely smooth. When I arrived to mount my poster yesterday I found that I was not given the plinth I requested. Many other classmates seemed to have been given a small table which at the time I assumed they had also requested. There were no small tables left for me to choose from however there were two 2 plinths sitting aside. I thought it was weird that I was only one of two that had requested a plinth but assumed that as I hadn’t been given a table then the plinth must have been mine. Apparently many of those who had requested a plinth had been given a table instead which was weird since I had been given nothing. However no-one has told me I shouldn’t have the plinth that I am now using so I guess I’m good to continue using it. I am glad I do have a plinth over a table as I don’t think I’d be able to fill all the table space, and I do not have an appropriate cloth or covering for the table to make it look good. So my setup is good to go and as good as I could have made it. While I could have explored the possibility of a creative space, had I known I could have benefited from it I may have chosen to utilise them. 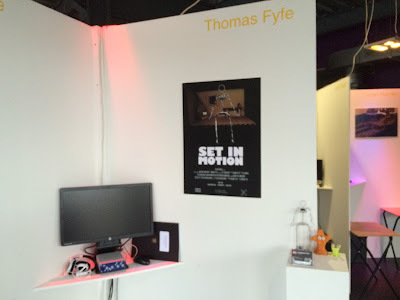 However I’m happy with my little booth and look forward to the prize giving ceremony and preview event tomorrow.